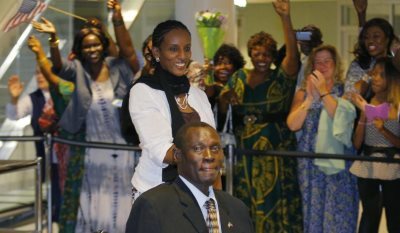 Meriam Yahia Ibrahim and her husband as she arrives in the U.S.
AFRICANGLOBE – The Sudanese woman who refused to renounce her faith in the face of a sentence of death by hanging, has come to the end of a horrific ordeal as she, her husband, and two children were reunited with her husband’s extended family when they arrived in Manchester, New Hampshire last night. Meriam Yahia Ibrahim, 27, who was raised as an Orthodox Christian by her mother when her Muslim father left his family, was denounced by a relative for having married Daniel Wani, a Christian Sudanese man with US citizenship who lives in Manchester. Meriam was thrown into jail even though she was pregnant, then charged and convicted of apostasy and adultery under barbaric Sharia law, even though she maintained throughout her trial that she had been a Christian all her life and had never been a Muslim. “I am a Christian and I will remain a Christian,” Meriam declared in a Sudanese courtroom in May. Meriam was imprisoned with her 20-month-old son Martin, and gave birth to her daughter Maya in the prison shortly after sentence was passed on her. Her treatment by the genocidal Sudanese regime triggered global outrage. After intense pressure on the Omar al Bashir regime by human rights organizations and Western governments to reverse the sentence, an appeal supported by Pope Francis, Meriam was released on June 23. She was then re-arrested when she tried to leave the country, but was subsequently released again and given asylum in the US embassy in Khartoum. Last week she was finally allowed to leave Sudan. Meriam flew to Rome with her family where they met and had a private audience with Pope Francis. “The Pope thanked her for her courage and witness to faith, and she thanked him for his prayer and solidarity,” Vatican spokesman Father Federico Lombardi said in a statement. Fr. Lombardi said Pope Francis met with Meriam’s family to show ”his closeness, concern and prayers” for all those who suffer for their faith, and especially for Christians who suffer persecution or restrictions on their religious freedom. On Thursday morning Meriam and her family flew from Rome to Philadelphia, where the city’s mayor, Michael Nutter, greeted them. According to a tweet by CBS Philadelphia news anchor Pat Ciarrocchi, Mayor Nutter described Meriam as a “courageous grace-filled woman” who is now on her way home. The family arrived at the Manchester-Boston Regional Airport at 8 pm Thursday night to a welcome by members of Daniel’s family and a cheering crowd of supporters.